So I've already let myself down with my Sunday post ritual but I think my excuse is acceptible. Basically one of my best girl friends goes to Reading uni and she was having a house party this weekend to celebrate her birthday. I ended up getting a lift with one of my friends and his mate. We left at about four on Sunday to come home and didn't get home till eleven ish (when I should've got home about half five). Basically his tyre completely went on the M25 so we were stranded on the hard shoulder in the freezing for the next hour and the rest of the saga lasted another three hours, what with waiting for a new tyre to arrive and be fitted. Although it was a nightmare, it was pretty funny and I had a good weekend overall. I'm hoping after hearing my story you can forgive me! Today I thought I would show you my favourite nail polish at the moment which was only £1.99! I had been really wanting Topshop's electric blue nail polish Awol for a long time but wasn't sure about forking out £5 on it. I was constantly trying to find a dupe when I was surprised to find one by Miss Sporty. Now I never look at the Miss Sporty stand in Superdrug or Boots. I used to like their products when I was about 13 but unfortunately the cheapish packaging doesn't do it of me anymore. HOWEVER, shade wise this was a serious contender for an Awol dupe and I love it!! I think the shade is actually called Pop Fiction but it doesn't say on the bottle. It's part of the 'clubbing colours' range and it only costs £1.99. When it came to application I was pleasantly surprised. It applied really well and I think with a reasonable coat you could get away with just one coat. I actually found the brush to be OK and in fact better than a Topshop polish I already own. 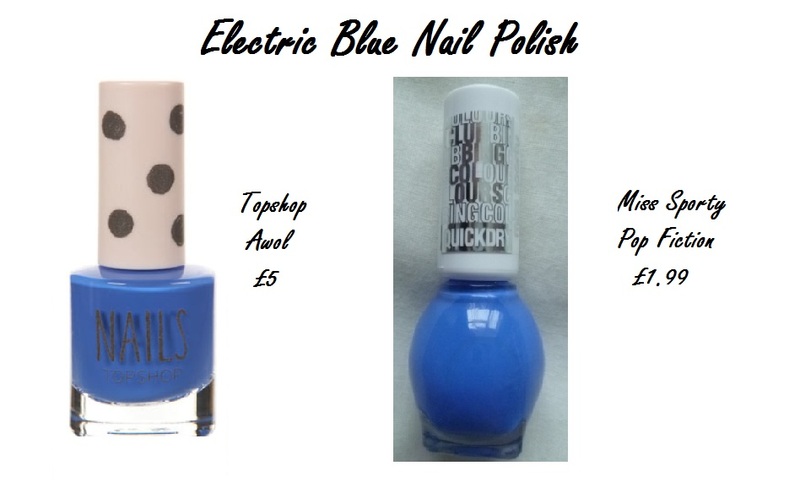 If you like the electric blue look on nails then this is definately one to try! I hope to get back into blogging pretty regularly but I've been back at uni for three weeks now and my third year is already turning out to be the hardest yet. I have so much reading to do and with my new job with more hours I'm struggling to find time to blog. I am going to try my hardest though and I want to start regularly doing outfit posts again as this is what I like to see the most from a blog.